The WCRC is in its final stages of completing their final design along Town Branch in Bentonville, Arkansas. The restoration area consisted of approximately 2,400 linear feet of restoration activity along Town Branch. The WCRC collected additional data as needed and developed a final design that met permitting requirements. The WCRC conducted all work required to implement the stream restoration including materials procurement, contractor selection, construction oversight, and implementation of a site re-vegetation plan. 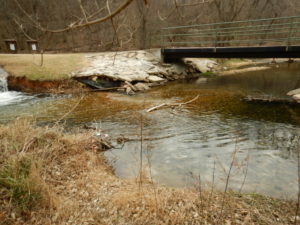 The over-arching goal of the work was to construct a natural channel that is able to protect park and trail infrastructure, help to improve water quality, and improve the appearance of the City’s natural landscape. Bed features such as riffles and pools were designed and constructed based on the stream morphology. Rock vanes and toe wood structures have been used to stabilize the streambanks and create aquatic habitat. Also, riparian areas are being re-vegetated with native species of plants and invasive vegetation will be removed as the project matures.